Shepherd’s purse, Capsella bursapastoris, has a long history in herbal medicine for the treatment of menorrhagia or heavy, clotting, excessive menstrual flow. It has powerful anti-hemorrhagic and astringent properties making it an invaluable treatment for heavy periods and gynecological hemorrhage. 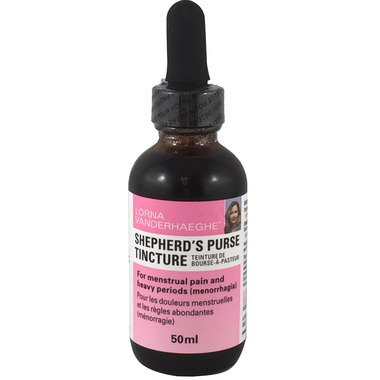 Shepherd’s purse contains a protein that is similar to oxytocin the hormone that causes constriction of the uterus. Shepherd’s purse lesser known actions include treatment for varicose veins, spider veins, hemorrhoids and helps those who bruise easily. Shepherd’s purse has also been used to heal the mucosal membranes of the digestive system where it can reduce gas and bloating and relieve constipation and diarrhea. Shepherd’s purse is useful in gastritis, colitis and other inflammatory gut conditions. It is also an important treatment for those with gout or rheumatic conditions. Directions: 2.5 ml (1/2 teaspoon) in water, every three hours during the first 2-3 days of menstrual flow; to prevent dysfunctional uterine bleeding, take ½ teaspoon 3 times daily for 10 days preceding the onset of menstruation; for diarrhea and bloody diarrhea, use 2.5ml to 5ml in water 3 times daily. As this condition improves, reduce dosage slowly. Non-medicinal ingredients: Purified water, drinking alcohol. Consult a healthcare practitioner if symptoms persist or worsen. Do not use if you are pregnant or have kidney stones. This product does not contain artificial preservatives, colors or sweeteners, no corn, dairy, gluten, soy, GMO, wheat or yeast. Great product. Reduced blood flow significantly. My period was cut in half after taking it. Recommend taking it as soon as you get your period or a day before. I feel like this really made a difference during my last period. Instead of 3-4 days of super heavy flow, I had only one heavy day and the rest very light. Going to try again next month at a lower dosage and see what happens. I am going through menopause and have had spotting on and off for years. Sometimes lasting 1-2 months without stopping!! Had all kinds of tests done, nothing is wrong with me. I went six months with no spotting or period and thought I was done but NO!!! I have been spotting and then seem to have a heavier period again. A friend told me about this product and within 3 days my bleeding has stopped completely!!! I am so happy. Not sure how long I will take it but I will wean off if slowly. I use this product to reduce the amount of blood flow in my period. It's AMAZING stuff! I've tried so many different products and I'm so glad I found this stuff. I suggest starting to use it a day or 2 before you get your period. I use about half of the recommended dose and it does wonders!